The following is a guest post by Pankaj Parashar. Pankaj is our resident expert on all things <progress> and <meter> and this post is more evidence of that. Here, he walks us through implementing a password strength meter using what is likely the semantically best option. A number of major websites like Dropbox, Gmail and eBay, rely on some kind of an indicator to indicate the strength of the password to the user during registration. The indicator serves as a good reminder for the user as to the level of difficulty to crack the password. 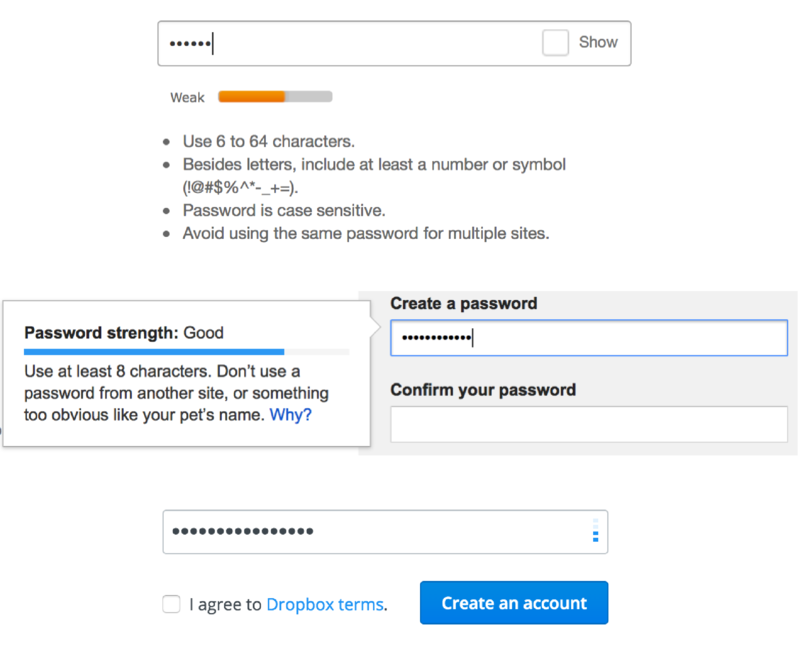 Showcasing the password strength indicators from eBay(Top), Gmail(Middle) and Dropbox(Bottom) in varying forms, essentially representing the same information. Although this practice is not new, most of the implementation for the password strength indicator I've seen so far uses the same old markup of <div> and <span> to represent the indicator. With the introduction of HTML5, we now have the ability to use the <meter> element in our markup, which in my opinion, is semantically more accurate and perfectly suitable for this password strength indicator use-case. Throughout this article, we'll call it the password strength meter. Why not use the HTML5 <progress> element? As the name suggests, the HTML5 <progress> element is used to indicate the progress of a task or an activity. Representing the strength of the password, isn't really a task or activity. It's not something that has progress towards a goal or is ever complete. Hence, it is safe to conclude that the <progress> element is not the right candidate for this use-case. How to calculate the strength of a password? It provides a simple API that takes a password as the input and returns a score from 0 to 4 as the output to indicate the strength of a password (0 - weakest, 4 - strongest). This works quite well with our <meter> element, that can accept a value within a predefined min-max range. It estimates a realistic strength of the password, by detecting all the possible overlapping patterns and then matches it against several English dictionaries, common passwords, keyboard patterns and repetitions. It is built by Dropbox! The official blog provides much more information on the technical details about the algorithm. If you are not familiar with the HTML5 <meter> element, then CSS-Tricks has just the right article, to get you up and running with the basics. I would strongly recommend reading it before you proceed with this article. Let's start with a basic markup: an <input> field that accepts a password, with a paired <label>. We'll add the <meter> element below the <input> along with a text element where we can affirm and explain the current value represented by the meter element. Since, zxcvbn returns a value in range of 0 to 4, the minimum possible value of the meter is 0 whereas the maximum possible value is 4. If not specified, the default value of the min attribute is always 0. 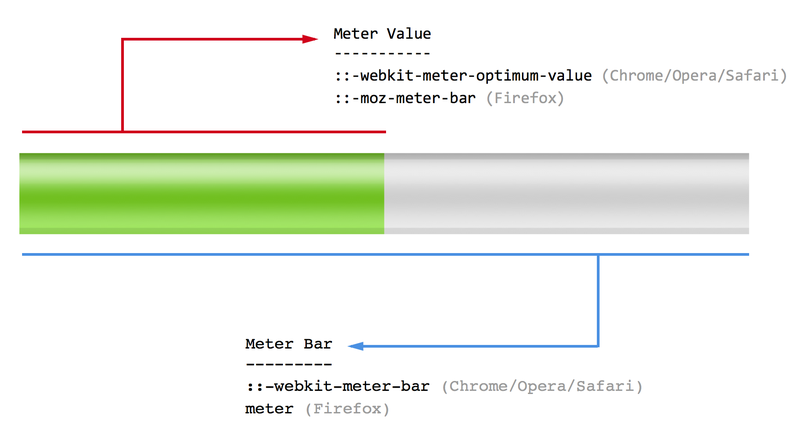 W3C recommends including a textual representation of the current value inside the meter tag for older browsers. However, we'll keep it blank for now and discuss the possible fallback techniques later in the article. In this section, we will only focus on styling the <meter> element. I'll leave the styling of the rest of the markup as an exercise for you. In order to understand how to style the <meter> element, we need to peek under the hood of the browsers to deconstruct the implementation of the <meter> element. Illustrating the implementation level detail of the HTML5 <meter> element in the various rendering engines. The score represents the strength of the password. The higher the score, the more difficult is the password to crack. We will represent each score with a different color to provide a visual feedback to the user. We can skip styling the value="0", as it will not be visible. Before we proceed, lets include the zxcvbn library from cdnjs right before the body element using a <script> tag. zxcvbn also includes an optional user_inputs argument which accepts an array of strings that it uses as a blacklist to penalize passwords containing user's personal information from other fields like name, email etc. Now every time the password field is changed, we will pass the password to the zxcvbn function and update the meter using the resultant score. In addition to updating the value attribute of the meter, we will also update the accompanying text to indicate the strength of the password to the user. Secondly, attach a listener to the password field that will listen for the changes and then update the meter and the text indicator. The demo Pen additionally employs feedback.warnings and feedback.suggestions to provide a relevant and useful feedback to the user, to help them choose a less-guessable password. See the Pen Password strength meter by Pankaj Parashar (@pankajparashar) on CodePen. If for any reason the demo fails in your browser, you can watch this video. As it stands, our password strength meter works quite well in all the browsers that support the HTML5 <meter> element. The good thing is, we do not have to worry about the browsers that don't support it. Those browsers will simply ignore the <meter> tag and render the text after the meter, which is a decent fallback to indicate the strength of the password to the user. If you're determined to provide a consistent user experience across all the browsers, you could simulate the appearance of the meter using a combination of <div> and <span> markup inside the <meter> element. Browsers that do not understand the <meter> tag will simply ignore it and instead render the markup inside. I've described this method in detail in the fallback section of my previous article on CSS-Tricks on the same topic. Are password strength meters good from the UX point of view? This article doesn't intend to spark a debate on whether password strength meters are good or not. There are probably, rational and reasonable arguments on both the sides. However, most of the argument stems from the inability of the algorithm to provide a realistic measure of the strength of the password. I think Dropbox has nailed it with the zxcvbn library because it offers a much more realistic estimation of how difficult is the password to crack. Whether you use it in your design or not, is up to you. But if you decide to take the plunge, then make sure you use the HTML5 <meter> element! If you’re going for a hue shift for the meter indicator, I’d flip orange and yellow (red > orange > yellow > green). Yep. That’s part of the natural order of the color spectrum: red > orange > yellow > green > blue > indigo > violet. I’ve always used the following mnemonic to remember the order: Robert of York gained battles in vain. Although, I just discovered upon doing a search on Google that it’s actually Richard of York who gained the battles. The thing is, I don’t even know who Robert or Richard is and what battles were fought! Makes sense. Thanks @Kevin and @Wayne for the input. I’ll keep that in mind going forward. Am I understanding correctly that passwords are being sent to another site (api)? In the clear? Is this not bad? (Genuinely asking). No, the zxcvbn api is loaded on the client. Nothing is being sent until the user submits the form, at which point the information is (hopefully) being sent to your server. This is not correct. The source code for the library has a massive list of strings that are common for passwords. It’s matching against those, and general patterns, to get the result. No network activity. No plain text passwords transmitted. so there is sending of any password to any other site. Also, I would style the 0 value if you were doing this because when you remove the password the meter flashes to green (the default) when transitioning back to 0.